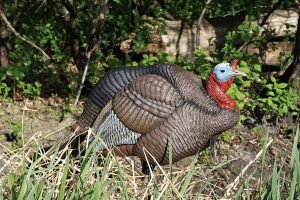 If you are looking for a decoy to lure in prey, then you want to make sure that you get the best turkey decoy possible to make your job easier. And while turkey decoys do make your job easier, always remember that decoys won’t make up for bad scouting or picking out a bad spot. What to Look For in a Turkey Decoy? Weight and size are important factors to consider if you’re going to be hunting far away from the crowds as you don’t want to be carrying around extra pounds for long periods of time. In many cases, you’ll also be carrying your hunting blind and other gear with yourself, and unless you have a lot of empty room in your hunting bag, then consider getting an either collapsible or an inflatable decoy. These tend to be the most popular of the three as you can very conveniently and easily pack them. These tend to look pretty realistic but you need to make sure to avoid keeping them in the folded shape for too long as they can get creased and difficult to reshape. However, you can use either a hair dryer or some other kind of flameless heat source to reform the decoy. Inflatable decoys are also very convenient to pack, and they tend to vary from semi-to-pretty realistic. Do note that you need to blow it up like a balloon to set it up so it might take longer than other to set up. Solid decoys tend to look the most realistic and are usually very durable. However, their downside is that they are bulky to transport around. But once you get to your hunting spot, you can set it up extremely quickly as you don’t need to inflate it. Turkeys have fantastic eyesight, even better than ours, which is why it is important to pick out a decoy that looks realistic. And while they’re no hawks, they will still sense something is off if the decoy only looks good from far, and will not want to come near. While there is everything to gain and nothing to lose the more realistic the decoy, the only downside is that hard work and excellent craftsmanship in regards to the details also comes with a higher price tag. But be warned, while the cheaper and faker looking decoys might work well at a distance, the closer the turkeys get, the more suspicious they will get. This is true especially if the decoy is standing 100% still, which is why decoys that move in the wind are also beneficial. There are some motion decoys that try to emulate how a real life turkey would move, like the MOJO. These ones typically move in a more advanced manner, can flap their wings and can even move their heads. They run on batteries. Most of the decoys that you will find, however, are more likely to have motion based on wind as that is cheaper to implement and seems to work pretty well. There are some that can spin around on their stake and some unique ones that can simulate feather movement like the Miss Purr-fect. 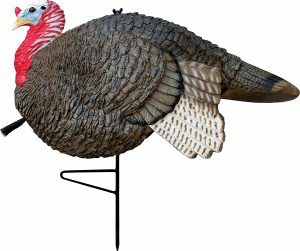 A worthy part of anyone’s turkey decoy collection, you can get these in many options such as a full strutting tom or even a simple fan decoy. 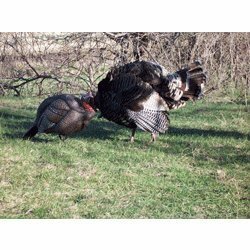 Save the full strutting toms for when you know there is a mature and dominant tom that’s around as a full sized strutting decoy can scare off jakes and smaller, less dominant toms. Jake decoys work the best at attracting toms to fight. Since a jake is a young male turkey, the older toms will have no issues battling it since they are bigger. 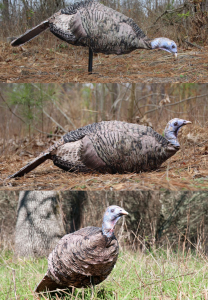 Some of the jake turkey decoys are also in a ¼ strut position which helps to make the toms more aggressive. During the spring breeding season, almost any tom or jake will come to a hen to attempt to breed. They come in different stances like standing, submissive breeding and feeding, all of which work well to attract toms and jakes. You can also pair one up with a jake so that when a tom sees what’s going on, it will come jealously and try to attack the jake, leaving you an open shot to do whatever you please. Talking about price tags, in the decoy market you usually get what you paid for. If you just want a nice little budget decoy to maybe fool a few turkeys then you can get the Primos Gobstopper. If you are looking for a premium, high quality option, then consider the rest of the ones on this list. A new entry in the turkey decoy field, the Avian-X Laydown Hen is a new model introduced in 2016 and is quickly gaining ground as the best turkey decoy. 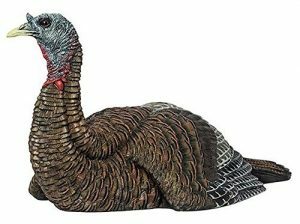 Like other Avian turkey decoys, this decoy features a rubber body and looks very realistic. The paint and finish look well done and durable, and so far, no issues were reported from its users. As time goes on, we will see just how durable they are though, but knowing Avian-X, they should be able to last quite some time. In addition to durability, these decoys also fare well if they are pushed around or abused. This is thanks to the wide flat base of the decoy giving it a good stability. Plus there is no stake that you need to worry about here, you just pop it out and lay it on the ground. To help you carry it around, it also comes with a drawstring bag. The decoy itself also weighs in at 3.4 lb. One great thing about this decoy that I like is that it’s designed to simulate the hen in her breeding position. The head is high and the wing positions match those of their real counterparts when they are ready for reproduction. All of these things help it to look authentic and one hundred percent receptive to incoming gobblers. The only con that I can think of is the price. There are cheaper alternatives available, but you lose realism and quality if you go cheaper. But that’s pretty much it for the cons. In the end, the Avian-X LCD Laydown Hen Turkey Decoy is a good hen decoy that will do its job fine, thanks to its craftsmanship and realistic look. If you’re on the market for a decent looking turkey decoy, but are not willing to spend a lot of money on it, then the Primos Gobbstopper Jake might be a good choice. The turkey decoy itself looks pretty good, and the paint job seems to look solid. Obviously, the detail isn’t quite on par as the more expensive options, but considering its price, there is nothing to complain about. In fact, it actually looks more realistic than some of its similar priced counterparts. Its stance is mainly submissive to make it look vulnerable for toms. Its ¼ strut jake posture also makes the toms more aggressive and likely to approach. You also get some slight movement in the wind thanks to its stake. The decoy is around 3.2 lb. and is advertised to be easily packable, but many owners have stated otherwise. While it’s not too heavy, the decoy itself is hard to collapse. There are also some reports of people having the decoy have a side that will stay folded in, which will detract from its authenticity. Considering its price however, this decoy is a great value and is worthy enough to give a shot. While I’m not really sure where “purr” comes in for a turkey, this decoy is pretty well made and deserves to be considered. Starting from its look, it might not look ultra-realistic but the feather cuts for it do manage to enhance its authenticity. And considering the more realistic looking decoys cost much more, there’s not much to complain about here. Talking about the feather cuts, I liked the fact that those cuts also flutter in the wind slightly, which helps to make it look more real to other turkeys. Now the biggest selling point of this decoy is the fact that you can actually adjust its poses to anything that you want thanks to its PERFECT POSE TECHNOLOGY ™. Basically it’s just fancy words for a bendable wire head and 2 slots for the stake. For example, if you want to put the turkey in the breeder pose, just take out the pole and reposition the decoy’s head as desired. Maybe you want to put it in a looker pose instead. Easy enough, just use the front leg pole sleeve and bend its neck upwards. Finally, if you want to put it in the feeder pose, you can use the rear leg pole sleeve and then bend its neck forward. I really like this feature as it allows you to change your configuration on the fly and also saves you money buying different decoys with different poses. The decoy itself can also be folded pretty easily, and you can use the included nylon buckle to tighten it up. Plus it’s pretty lightweight weighing in at only 1 lb. 6 oz. In conclusion, this is a solid decoy which may not be the most realistic, but is one of the most versatile options currently available, which makes it the best turkey decoy for those who change their configurations a lot and don’t want to carry differently posed decoys in their bags. Ah yes, the Dakota Decoy’s X-Treme Jake. You’ve probably heard about this decoy before seeing as its owner does more marketing for it compared to any other decoy companies. Additionally, this turkey decoy was also called best turkey decoy – literally, that was its name. Now does the name live up to its standards, or is it just all snake oil? Let’s find out. First things first, this decoy is an almost direct copy of a Dave Smith decoy. However, the difference is that they have undercut the price to be competitive. Dakota Decoy can do that since their product is imported from China. However, the benefit of being a copy is that it retains pretty much all of the great features of the Dave Smith decoys. It looks ultra-realistic which will help you bring in toms that will remain here after seeing it close up. The decoy itself is made from EVA plastic. EVA is basically a polymer that is rubber like regarding its flexibility and softness but is also tough. Since it is made of plastic though, it is not collapsible. It is also pretty heavy, coming in at 5.6 lb. The paint looks well done and durable, and won’t flake off easily. Like any other great jake decoy, the X-Treme Jake has an arrogant posture with a slight head tilt to make toms angry. Finally, you also get a carrying bag that is included with it to carry it around with you. So is the decoy really the best turkey decoy, or is it just another decent decoy? If you’re looking for an ultra-realistic decoy and don’t mind the weight or the fact that it is imported, then this may be the best decoy for you. However, for those who prefer inflatable and lighter weight decoy should consider some other choices. 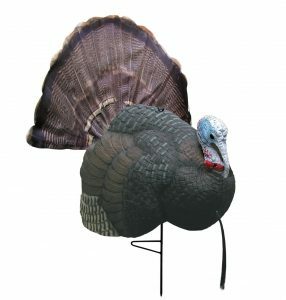 If you’re looking for a full strut turkey decoy to add to your collection, then the Primos B-Mobile is a good choice. The decoy itself is mounted on a metal stake, and the construction feels pretty durable meaning that it should last you quite some time. Since it is on a stake it also moves in the wind which further adds to its realism and authenticity. While on the topic of realism, the decoy itself looks pretty good, and if you want to you can additionally replace the built in fan with your own thanks to its fan holder. If you do decide to replace it, don’t forget to put the feathers in the order that they were taken out. You get an included mesh bag with backpack straps to carry the decoy around with you. And while the decoy itself is not heavy since it weighs in at a total of 4.1 lb., it is pretty bulky in regards to its size which can make it challenging to carry around with you. This is especially true if you have a smaller backpack or one that is filled with other gear. However, once you get to your desired location, you can just plop it down on the stake and it’s good to go. Since it is a full strut gobbler you can potentially scare off some weaker toms and jakes, but the aggressive and dominant ones will come full force at it. Since they’re so concentrated on the decoy, you can focus on getting your shot down. If you’re looking for the best turkey decoy that’s in the full strut position, then Primos B-Mobile will work well for you. 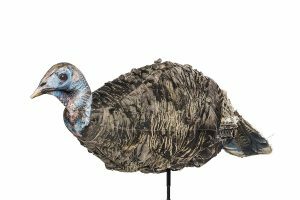 So there you have it, reviews of some of the best turkey decoys that are currently out. Different decoys offer different pros and cons, and each has their own use. But regardless of whichever one you choose, it’s almost always better to have one in addition to your turkey whistle to lure unsuspecting turkeys near to bring home a trophy longbeard. 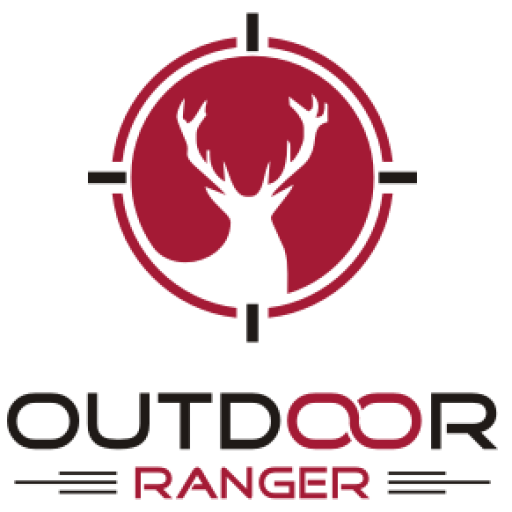 Outdoor-Ranger.net is a participant in the Amazon Services LLC Associates Program, an affiliate advertising program designed to provide a means for sites to earn advertising fees by advertising and linking to amazon.com or myhabit.com. Amazon and the Amazon logo are trademarks of Amazon.com, Inc. or its affiliates.